2. 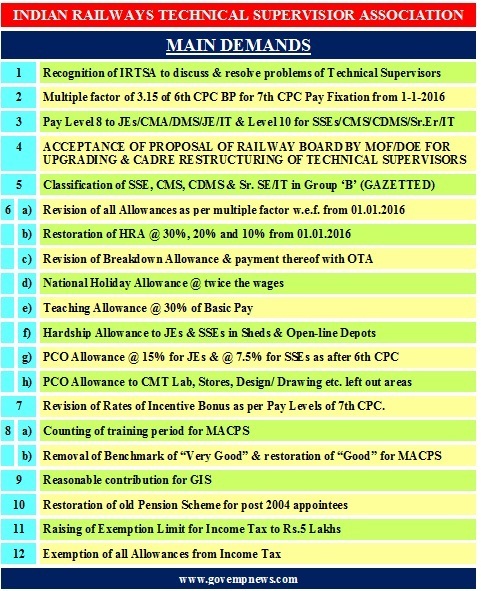 Multiple factor of 3.15 of 6th CPC BP for 7th CPC Pay Fixation from 1-1-2016. 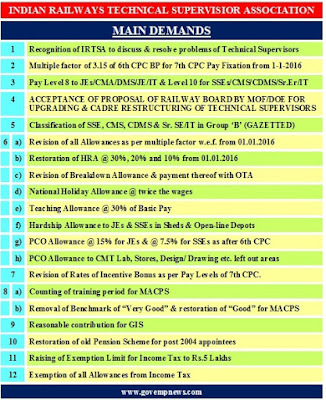 6. a) Revision of all Allowances as per multiple factor w.e.f. from 01.01.2016.
b) Restoration of HRA @ 30%, 20% and 10% from 01.01.2016.
c) Revision of Breakdown Allowance & payment thereof with OTA. d) National Holiday Allowance @ twice the wages. e) Teaching Allowance @ 30% of Basic Pay. f) Hardship Allowance to JEs & SSEs in Sheds & Open-line Depots. g) PCO Allowance @ 15% for JEs & @ 7.5% for SSEs as after 6th CPC. h) PCO Allowance to CMT Lab, Stores, Design/ Drawing etc. left out areas. 7. Revision of Rates of Incentive Bonus as per Pay Levels of 7th CPC. b) Removal of Benchmark of “Very Good” & restoration of “Good” for MACPS. 9. Reasonable contribution for GIS. 10. Restoration of old Pension Scheme for post 2004 appointees. 12. Exemption of all Allowances from Income Tax.